The IRE has participated in the competition of the Austrian Foreign Ministry for the European State Award. Over 70 applications were submitted and that IRE came under the top 10 through its importance of regions and cities in European politics and in economic development. Until today, more than 130 regions, cities, companies and cooperation partners have chosen the IRE as a principal interlocutor for the promotion and support of their interests on the European level. In addition, the liaison office of the region of Salzburg in Brussels (“EU Information”) as well as the EU citizens’ service/Europe Direct Salzburg (“EU your Vision”) took part. We congratulate the prize-winner Katharina Moser (“Route 28″) from Salzburg, to whom the prize went! 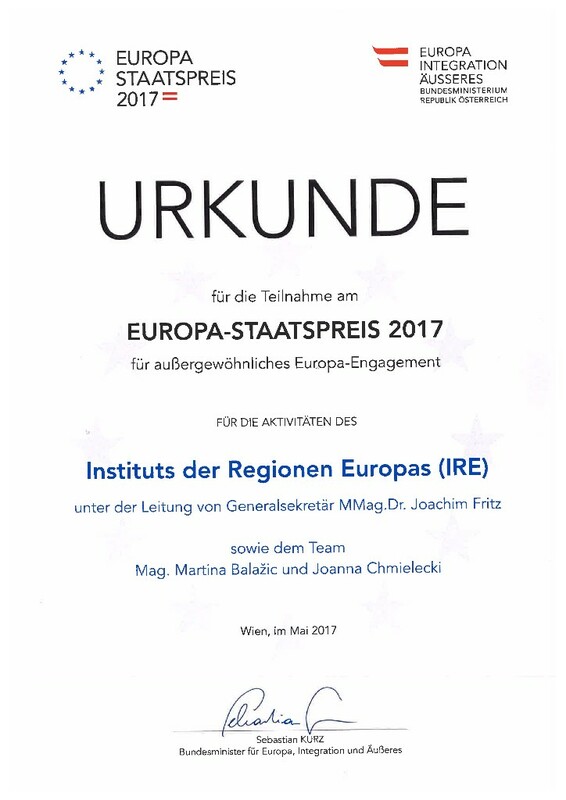 The Europe State Award of the Federal Republic of Austria honours extraordinary commitment by citizens and organizations that promote greater European awareness and understanding of Europe. The European State Award, which is awarded for the third time this year, goes back to an initiative of the Austrian Federal Ministry for Europe, Integration and Foreign Affairs (BMEIA) and is endowed with 10.000 Euros.